The historic village of Tyalgum is set against a stunning backdrop of the wall of the Mt Warning Caldera and has a cluster of lovingly restored quaint old buildings. It’s the kind of village you want to pack up and move to, all green meadows and dramatic mountains. Including an old pub and a general store, there are a few other businesses to potter around in. Flutterbies Cottage Cafe has an extensive menu for breakfast and lunch dishes, as well as a host of items for morning or afternoon tea. It’s a cute yet elegant (kitsch for some) tea room with waitresses in period dress to look the part and to match the pastel colours of the furnishings. If you have a phobia of rooms full of teddy bears, sit outside or in the semi covered alleyway between the two buildings. For an extra dollar on the Devonshire Tea, I order a “mixed plate”, which gives me one plain and one lavender scone. 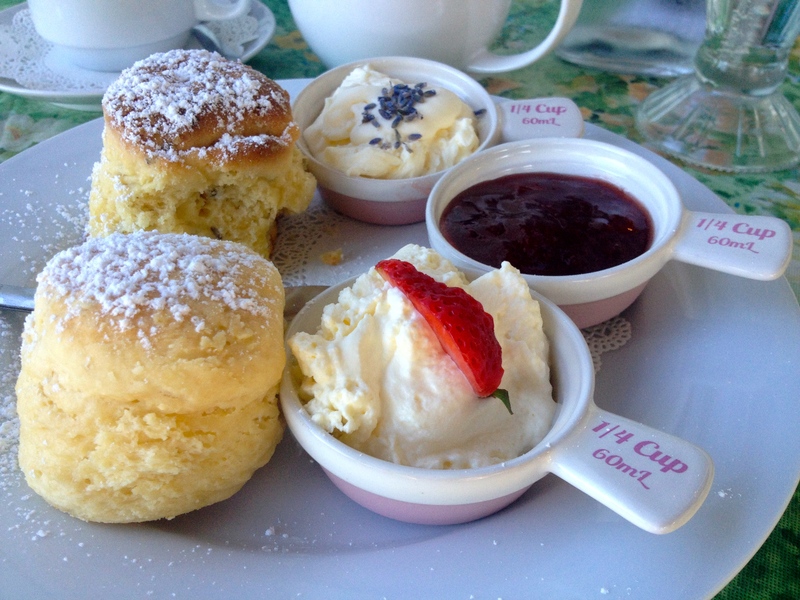 Although the scones share the same strawberry jam, they each come with their own cream. Both the lavender scone and cream are infused with lavender, which works really well together and the flavour is not overpowering at all. Overall the scones are fluffy and just the right size, however I do find the lavender scones slightly dry – it is 4pm after all! Tea: A selection of loose-leaf teas served in a good-sized teapot. Overall: Cute, atmospheric and tops off a perfect afternoon drive in the country.